- Small Change, Big Deal. Money as if people mattered. Describing her efforts in Ghana, Madagascar, South Africa and London, Jennifer Kavanagh explores microcredit’s successes and failures. She includes both her own fascinating perspective, as someone who has founded award-winning peer lending programmes, and the under-represented perspectives of those borrowing money. 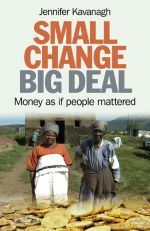 Pioneered in one of the world’s poorest countries, microcredit has much to teach us all in an age when financial systems worldwide are in question and new economic approaches must being considered. In Madagascar, thanks to a loan, Tandi started her own business selling sugar and cooking oil ; the proceeds allowed her to buy her children school uniforms. Money is about trust, and microcredit is successful because it remembers this. Almost 40 years after the publication of E. F. Schumacher’s visionary book, small is still beautiful, and people still matter.